Those of us who love eating street food, but hate taking lunch back to our desks, have a common problem. Where should we eat? There are a number of indoor pavilions and outdoor seating areas scattered across Midtown, but sometimes I just wish there was a place right next to the carts to just saddle up and tuck in. Well thanks to Pratt Grad Student Ali Pulver, now there is. For her thesis she is developing a couple of tools to make it easier for us to eat on the street. 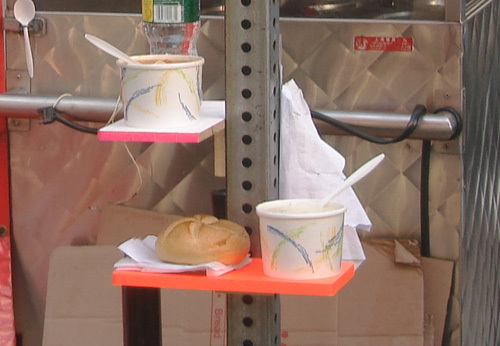 And after testing out the “Lunch Ledge” and the “Hydrantable” last week, I’ve got to say these could represent the greatest advancements in street food technology since the invention of chicken and lamb over rice! It’s not hard to just stand on the sidewalk and eat lunch if you just have one tray of food and a fork. But what about a drink? Or soup, which usually comes with bread. Add a drink to that and you’ve got big time issues. That’s where the lunch shelf comes in. The back is a heavy duty magnet, so you can attach it to any sign post and voila! Instant place to put your drink. Or soup. Or whatever. But that’s not all. What do you see here? A standard fire hydrant? 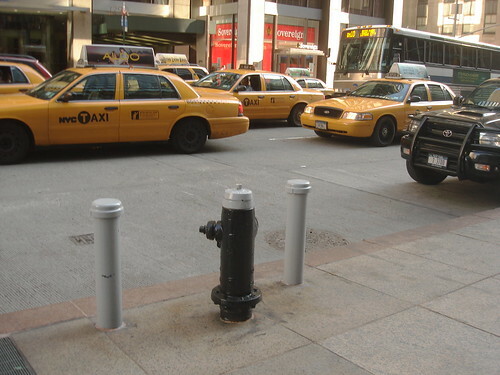 Well, I see a perfect spot for two people to eat lunch… with a little help from the Hydrantable! 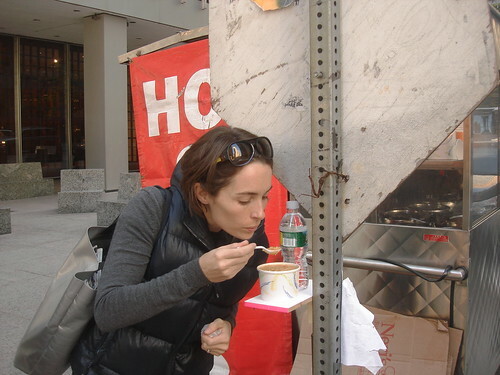 The lunch shelf and “hydrantable” aren’t available for purchase just yet, but Ali has set up a website where you can track her progress called Pop Up Lunch: NYC. And she’s hoping to get her ideas produced as soon as she is out of school in December. If there is a pre-order list, sign me up! Posted by Zach Brooks at 11:45 am, November 6th, 2009 under Street Vendor Issues. …it’s piece of plywood…with a hole in it….make ya own..
Haha Good one Rudy, but I still think it’s awesome. Bring it on! I could use one of those after I visit the Biryani Cart. Does it also come with a pop up toilet that is often necessary mere minutes after finishing your street meat? It’s just a prototype. It’s bulky. No doubt you could make it thinner by using plastic material, and more compact by making it fold up and use hinges. This is an inspired idea, and I love the execution. Great job, Ali Pulver. 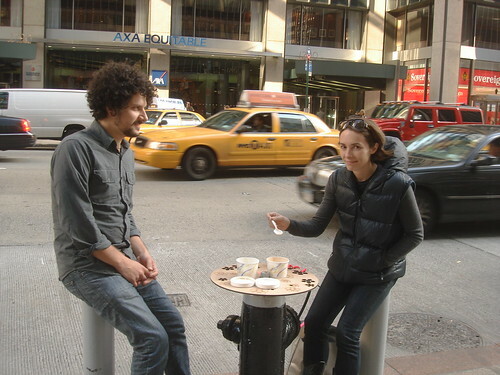 But the fire hydrant table is definitely illegal and affixing magnets to stop signs may be as well. God bless. hm, on top of a fire hydrant…i feel like that isnt going to work. Eh. The worst that happens is a police officer tells you to move the tray. The magnetic tray is awesome, though. I once lived in a town where a guy with a fire hydrant in his front yard decorated it for christmas. He simply wrapped a garland around it. Cost him a $500 fine! But then the people in Texas are not nearly as liberal as the police in NYC. I desperately need one! What a great idea for a thesis! What about the dog crap near the poles and fire hydrants? I like the first pic, four women around a pole. Do you know what dogs like to do on fire hydrants? haha… when was the last you saw a dog in Midtown? The dogs are everywhere. They plan to take over the world. Interesting concept, but I think it is too weird. And the dogs that are in Midtown are usually so tiny I’m surprised they can make it up a curb. 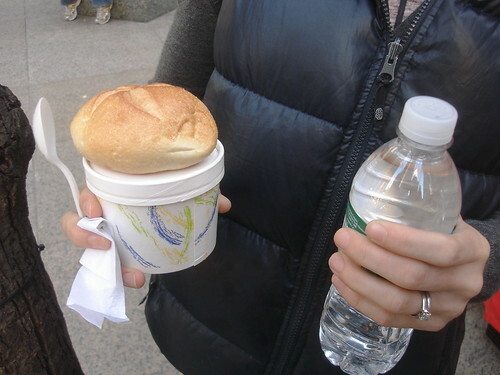 very interesting idea… my only thing is, when would you bring that with you to lunch? every day? so in case the place you want to sit isn’t nice, your table is handy? agreed, i dont want to eat anywhere near where dogs and hobo’s urinate….no thank you. and i see dogs in midtown all the time. Mainly seeing eye dogs, but they’re dogs…no discrimation here.